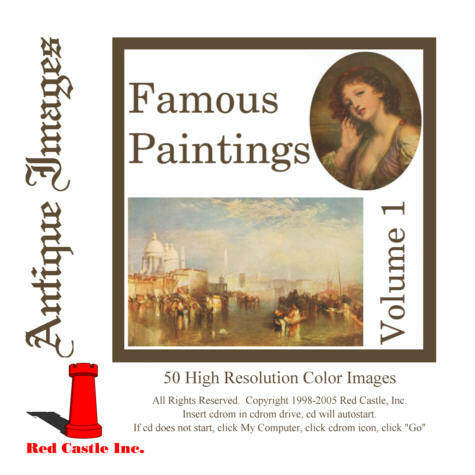 Antique Image Famous Paintings Volume 1 CDROM's by Red Castle, Inc.
Watts, George Frederick, R.A. "Hope"
Holiday, Henny "Dante and Beatrice"
Rubens "The Judgement of Paris"
Graham, Peter, R.A. "A Rainy Day"
Burne-Jones, Sir Edward Coley "King Cophetua and the Beggar Maid"
Walker, Frederick, A.R.A. "The Vagrants"
Sadler, W. Dendy "A Good Story"
Greuze, Jean Baptiste "The Listening Girl"
Lucas, J. Seymour, R.A. "Flirtation"
Gore, W. H., R.B.A. "'Listed"
Reynolds, Sir Joshua, P.R.A. "Infant Samuel"
Hals, Frans "A Man with a Glove oin His Hand"
Watts, George Frederick, R.A. "Life's Illusions"
Small, William "The Last Match"
Meissonier, Jean Louis Ernest "The Print Collector"
LaThaugue, H. H., R.A. "Mowing Bracken"
Henner, Jean Jacques "A Nalad"
Botticelli "The Madonna and Child"
Reynolds, Sir Joshua, P.R.A. 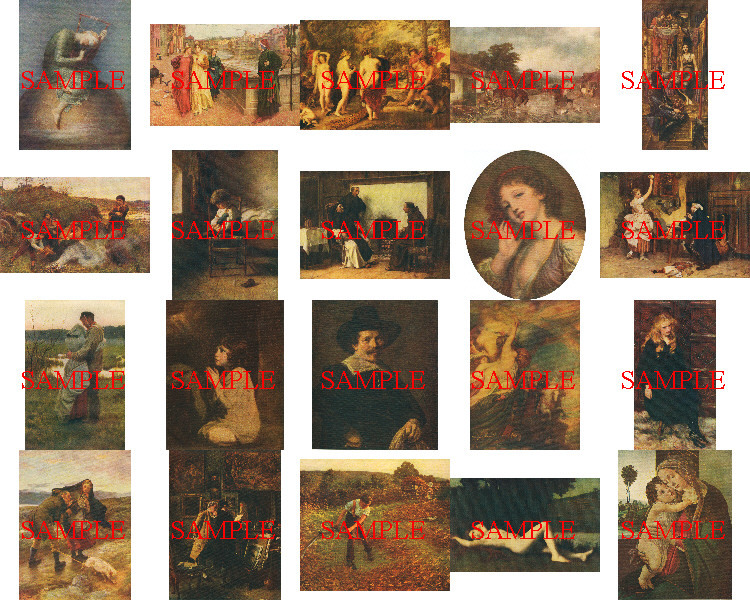 "The Strawberry Girl"
Turner, J. M. W., R.A. "Peace: Burial at Sea of the Body of Sir David Wilkie"
Bompard, M. "A Prayer to the Madonna"
Landseer, Sir Edwin, R.A. "Suspense"
Leslie, G. D., R.A. "Sun and Moon Flowers"
Lawrence, Sir Thomas, P.R.A. 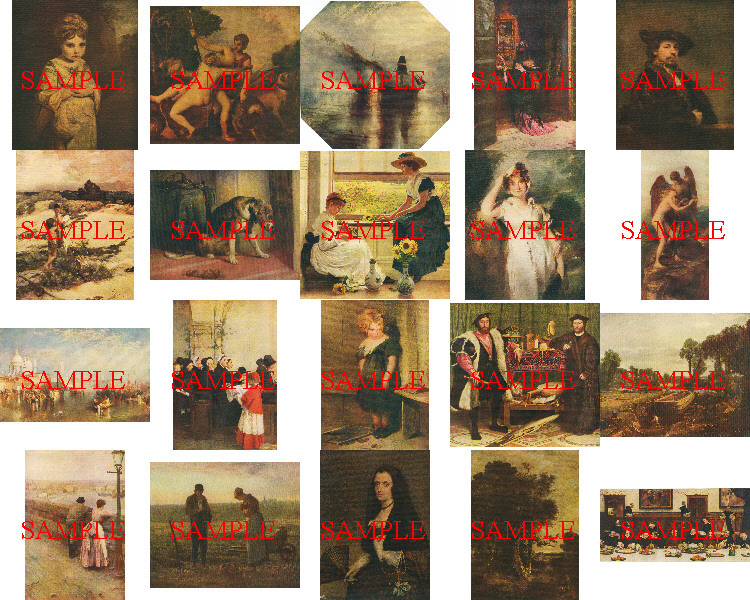 "Caroline of Brunswick, Queen of George IV"
Watts, George Frederick, R.A. "Love and Life"
Turner, J. M. W., R.A. "Venice"
Dagnan-Bouveret, Pascal Adolphe Jean "The Blessed Bread"
Landseer, Sir Edwin, R.A. "A Naughty Child"
Holbein the Younger, Hans "The Ambassadors"
Constable, John, R.A. "Boat-Building Near Flatford Mill"
Millet, Jean Francois "The Angleus"
Velazquez "Portrait of a Spanish Lady"
Crome, John "On the Skirts of the Forest"
Whistler, James McNeill "My Mother"
Turner, J. M. W., R.A. "Rain, Steam and Speed. The Great Western Railway"
Rommey, George "The Parson's Daughter"
Swam, J. M., R.A. "On the Alert -- Lioness and Cubs"
Guthrie, Sir James, R.S.A. "A Highland Funeral"
Orchardson, Sir William Quiler, R.A> "The Farmer's Daughter"
Burne-Jones, Sir Edward Cole "The Mill"
Millet, Jean Francois "Going to Work"
Furse, C. W., A.R.A. "Diana of the Uplands"